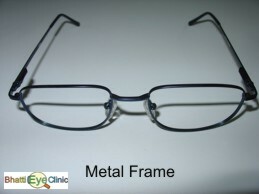 Types of frames The Bhatti Eye Clinic specializes in custom fitting of all type of spectacles,with the latest fully automatic machines. 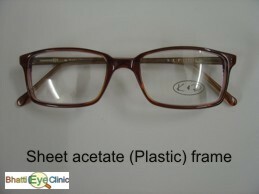 This ensures precision of fitting, of the spectacle lenses. For lenses such as progressive lenses where matching the optical centre to the patient's pupil is of utmost importance, fitting from photographic measurements, which eliminates many of the pitfalls of manual fitting, is done. These are more in fashion nowadays and have the elegant sleek look. Available in several colours and designs. 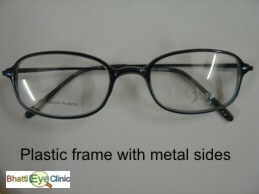 Are lightweight (even more so if made of titanium), but may not be suitable for thick lenses. 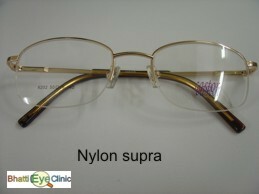 Nylon supra frames appear as though the rim is missing inferiorly. Actually a thin nylon string cunningly placed through a groove cut into the edge of the lens holds the lens up (like a hammock) against the upper visible rim. These frames are difficult to fit but their elegance makes it worth the effort. 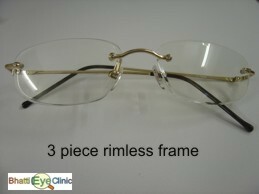 Three piece frames are totally rimless.The latest craze today but suitable only for those who are delicate in their handling of frames.